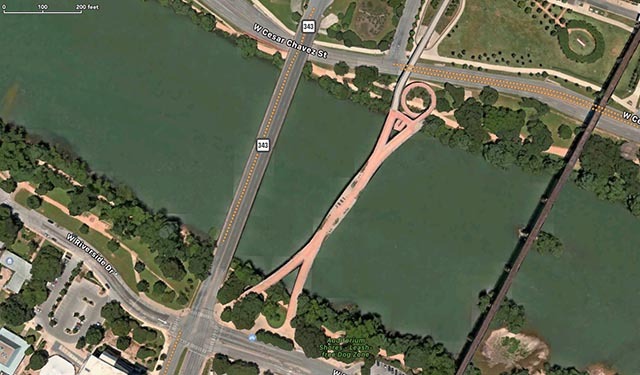 The Pfluger Pedestrian Bridge crosses Lady Bird Lake just east of Lamar Blvd. Accessible from the hike and bike trail, the most convenient parking is the short block of West 2nd St. between Seaholm Dr. and Lamar Blvd. The bridge too brightly lit for many targets, but provides great downtown backdrops for nightscape photography. It is also an excellent location for urban outreach sidewalk astronomy. There is a parade of people open to good views of the sky and conversation about astronomy and photography. Magnetic compass telescope polar alignments are not reliable, because of the ferrous metal reinforcements in the bridge structure. The center span of the bridge runs about 35 degrees east of north.